Don’t forget that tonight is Pub night, 8 pm at the Ascent lounge. Live comedy! Just a reminder to everyone that tomorrow night is Pub Night! Come on out to the Ascent Lounge above the British Arms. Doors open at 8 pm, and we have two comedians performing! Hope to see you there. As the green of summer gives way to a blaze of autumn colours, Laurentian @ Georgian’s 2012-2013 school year is well underway. It’s been an exciting September for the LSU, and we are looking forward to a ton of awesome events coming up in the months ahead! This is the inaugural issue of our monthly newsletter, which is our newest way of keeping in touch with you, our members. If you have anything you would like to see added to future newsletters, please e-mail services@thelsu.ca to make a request. This is the first year the LSU has taken over administration of the student health benefits, a change which has resulted in a $40 per semester savings for you, the student. Details of the plan will be available online as soon as the old provider stops making life difficult for the new one. In the meantime, please note that this plan was modeled to be identical to the old SAC plan, so feel free to refer to that. Remember, though, until the coverage booklet is made available we cannot guarantee the plans will be identical. If you have existing health coverage, you can opt out until the end of September. If you are a part-time student wishing to opt in, a form to do so is available on our website. This is also the form for adding dependents. The opt-in and add dependent deadlines are the same as the one for opting in: September 30th. The forms are available on our website @ http://thelsu.ca/services/health-and-dental-plan/opt-out-process .We apologize for the short notice but have only just gained the capacity to send out mass e-mails like this one. On Monday October 1st we will be organizing a trip to hear Slovenian Philosopher Slavoj Zizek speak after a screening of the movie The Pervert’s Guide to Cinema: Part 3, Slavoj is one of the leading philosophers and cultural critics in the Western World. The bus will be leaving Georgian College at the roundabout at 5:30pm, and leaving Toronto at 9pm. The talk takes place at Lightbox in Toronto at 350 King St. West, and tickets are 20$ per person. “In the most militarised place on earth, one man is standing up to the armed might of the world’s largest democracy. Kashmir’s Torture Trail follows a Kashmiri lawyer as he uncovers India’s best kept secret. No more than 30min at each bar, prizes will be given out. The crawl will end at the Foxx Lounge where we will be given free cover to watch the Friday Rock Show! The crawl starts at 9pm, for more information please visit the LSU Office in room E112A, or like the Laurentian Students’ Union on Facebook! Yves Engler talks about his forthcoming book ‘The Ugly Canadian: Stephen Harper’s Foreign Policy’ – 2pm in room K219. The LSU will be having its second annual flag football game. Come on out for friendly competition, prizes and a good time! Bring your jerseys and your A-game to the Georgian fields, at 1pm. October 30th will be the first of our monthly indie cinema nights. We’re screening “The Trotsky”, a Canadian film set in Montreal and starring Jay Baruchel. It is an honour and a privilege to serve as your president: fighting for your rights here at Georgian, in Sudbury, at City Hall and Queens’ Park. You are the union’s top priority –to help provide opportunities for intellectual and social engagement that might otherwise be scarce at Georgian College. From the outset, we have strived to face the unique challenges of our situation on this campus head on; our committed executive promises to hear your voices and do everything we can for you. As students, we are stronger together. Whether we are continuing the fight for accessible education, or working to promote an inclusive campus culture our members are our strength. This is your student union. Drop by our office in E112A so we can work together to make our voices heard! The start of a brand new school year has been a great success for the LSU, and orientation went off almost without any hitche. The first day saw new students treated to a free pizza lunch, and given a campus tour to familiarize themselves with the campus. At night we put on a free rock show featuring Sleepless, The Streetlights, and Elos Arma. The bands put on a memorable show, so make sure you don’t miss our next pub night! The second day of orientation we put on a dirty bingo game, where students came out and won some naughty prizes! We coupled this with free colts tickets we handed out all week to those who came to our office (Room E112A) to get them! The Colts played the Kitchener Rangers on the Sunday, and came out victorious, defeating the Rangers 5-2! This campaign aims to establish an independent Laurentian campus in downtown Barrie. Laurentian and the City of Barrie have put aside 14 million dollars each towards a university campus. The province has agreed to build three new universities in Ontario and has remained silent on when and where they will build these universities but Barrie has been noted as one of the top contenders by the media. The LSU is pushing the province to agree to a university in Barrie and provide funding for this institution. Come to the the LSU Office to sign the petition and be a part of the postcard campaign. AUTONOMY OR BUST! Other campaign info can be found on CFS website. The LSU is proud to announce the establishment of our coffee co-op. For $5, you can get a coffee card, which is good for 20 coffees, teas or hot chocolate. Get your cards in the LSU office. Intro week has come and gone, but we have lots of intro week swag left in the office. Come on down to E112A for lanyards, buttons, t-shirts, agendas and more! The LSU has been working hard to provide students with a more interactive educational experience through the development of various social media outlets. We now have a fully functioning website in which students can get a great deal of information regarding the LSU, its functions, the services we offer (including the health plan, the coffee co-op, free tax filing services etc), and all of the upcoming events and activities that are being run by the LSU. 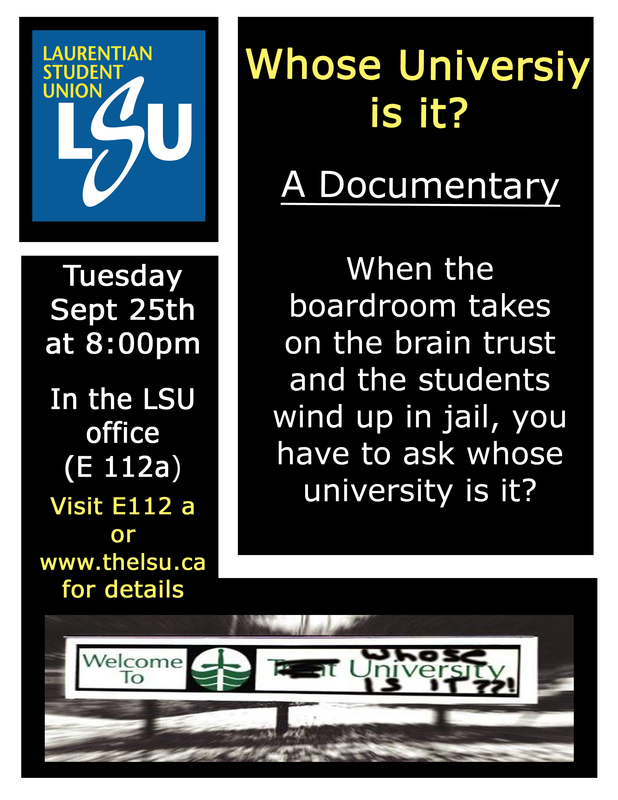 Students are encouraged to visit the website at http://www.thelsu.ca. Likewise, we now have a twitter account that students can follow – @the_lsu. Students are encouraged to follow us on twitter to get updates regarding student issues and upcoming events. They are also encouraged to tweet us if they have any comments, questions or concerns. The LSU continues to update their Facebook page on a regular basis, as well as create event pages to advertise our upcoming events. Students are encouraged to both join the group and “like” us accordingly. Our Facebook page is a great way for students to communicate with both the union and with other students, share important links and comments that they may have, as well as express any concerns they have regarding their post-secondary educational experience. Since the LSU has just begun using these social media outlets to interact with students, there is still a great deal of work to be done, specifically on the website and twitter feeds. It is a constant work in progress, but we are working as hard as we can to fill the gaps in our information. Students are encouraged to contact vpmarketing@thelsu.ca if they have any concerns or ideas regarding the website. The LSU office, located in E112A, is open 10:00am-5:00pm, Monday to Friday. If the door is closed during these hours it is likely just for a quick errand, so be sure to try again a little later in the day. Well, that’s all for the month of October. We here at the Laurentian Students’ Union hope everyone has had a good start to their school year and look forward to learning and growing together. Students in Ontario face the highest tuition fees in Canada, massive amounts of student debt and oppression on campus and in their communities… At the same time students are working together to challenge ignorance, support environmental action, create safe and inclusive campuses, and fight for fully accessible post-secondary education. Issues-based workshops including current issues in post-secondary education, the environmental impact of the Canadian Tar Sands, food security, intersectionality of oppression within feminist movements, and free education will provide participants with the knowledge needed to get involved in a variety of campaigns. Skills-based workshops including how to develop campaigns, public speaking 101, crafting a media message, departmental organizing, and organizing for graduate students will provide participants with the skills necessary to organize successfully on campus and in the community. Formed in 1981, the Canadian Federation of Students is Canada’s national and provincial students’ union representing over one-half million college and university students from more than 80 campus unions across Canada. In Ontario there are more than 35 Federation member local students’ unions uniting over 300,000 full-time and part-time students at both the graduate and undergraduate level. The Federation works with students across the province and country to advance its ultimate goal – a system of post-secondary education that is accessible to all, which is of high quality, which is nationally planned, which recognizes the legitimacy of student representation, and the validity of student rights, and whose role in society is clearly recognized and appreciated. The Federation also organizes a variety of equity-based and sustainability campaigns and provides several services to save students and students’ unions time and money.